We can take care of all the required work, whilst you solely have to receive the monitoring data. We take care of the installation, control of the data and equipment, and maintenance and removal of the equipment after finalization of the project. We check the performance of the sensors, and the produced data on a weekly basis. At any malfunction or error, we take action. In this way, we provide the best and most continuous data series. Data are stored online for at least 1 year. You can always access your measurement data online, including statistical data included in fact-sheets. You can choose which data you would like to read or export. Our GIS-viewer provides you with an even clearer overview of the data on a map. This helps in comparing data from different locations on your site. Groundwater levels are visible as referenced to N.A.P. (or any other National standard) and referenced to ground level. The “average highest groundwater level” and “average lowest groundwater level” are automatically calculated and provided. The GIS viewer provides various validation options, and data-exporting possibilities. We can provide these services at an attractive monthly rate. We can also support you in analyzing your data. We can, for example, analyses the long term (multiple year) trends in the groundwater level and / or benchmark your site’s groundwater level to that at other nearby locations. Our geohydrologist can link the groundwater level trend to precipitation data. 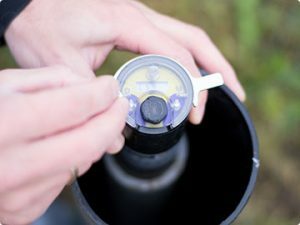 This way, you gain insight in the development of the groundwater level, which helps to assess the potential effects for flora and fauna in the area. We can additionally provide other control (manual) measurements to further help interpretation of the groundwater level data. If you would you like to know more about our services, please contact us.